This is a cell phone photo of a blown-up disposable camera photo. I also used a makeshift lighting umbrella to take this because I didn’t feel like taking this off the wall. The time before my blog is a weird place. I had a lot of adventures in high school and college, and I can’t recall an awful lot of them because I didn’t get to write them down. I’ve been trying to piece together one of them. 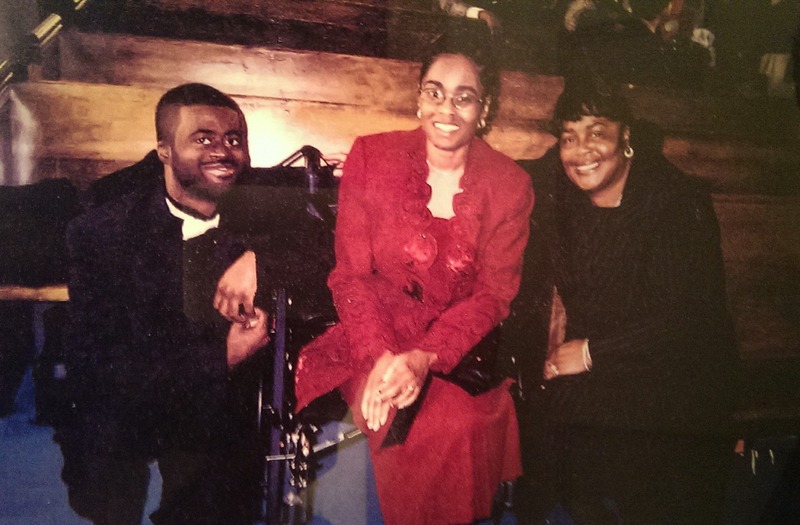 In November 2003, my sister’s mother-in-law got remarried in Baltimore. As I’ve probably mentioned ad nauseam, I’ve spent a lot of summers in Baltimore growing up because Theresa lived in St. Mary’s County, Maryland, up until about 1998 and my mom shipped me up there to keep me away from the horrible children in my neighborhood. Like the one who’s serving a life term in Florida that I’m pretty glad about. So, my mom and I were invited to the wedding. Well, it was more like I wound up going because my mom doesn’t like driving long distances. I didn’t get my own room, so I wasn’t amused. There was a nasty, cold rainstorm the night we got there, and the hotel’s satellite TV went out because of the driving rain. My mom sometimes goes to bed early, and I was utterly bored, so I told her I was going for a drive. She was a little concerned, because it was Baltimore and all, but I told her I would be fine. I’ve totally been there enough to know where not to go, especially at night. I was gone for while so my mom called to check on me. Another thing I’ve probably mentioned entirely too much is that my mom has this incredible knack for calling me at the worst possible times. The absolute worst. She called me about when I needed to make a turn because what was straight ahead was a part of town I’d never visited before. I shouted half-sentences to her and abruptly hung up after saying I missed my turn. Then the news came on. The top story was this: Man found at Ripken home reportedly fled kidnappers. The three men who left a naked gunshot victim near Cal Ripken’s house on Thanksgiving night likely didn’t know they were in the former Oriole’s neighborhood, Baltimore County police said yesterday. The shooting victim, identified yesterday as 20-year-old Brian Holmes Robbins, told police he was kidnapped near his apartment in the 1100 block of St. Paul St. in downtown Baltimore and released in a field near Ripken’s Worthington Valley home nine hours later. Ripkin called police not long after I told my mom I missed my turn, and what exactly transpired was still unclear when the news came on. Meanwhile, I was outside Towson and finally got my bearings in the pouring rain and poor visibility (because I needed to clean the inside of my windshield). My mom called again, frantic. I think it was one of the rare occasions that I’ve sworn at her; I couldn’t understand what the hell she was talking about. Once she asked me what I just said to her, established that she was making sure that I wasn’t naked and bleeding on Cal Ripkin’s front doorstep and I said something along the lines of I very well could be if you don’t get off the phone and let me drive in peace, everything was cool-ish. The next day, at the wedding, we took the photo included here. The entire weekend nearly faded from memory until my mom gave me a copy of the photo a few months ago. All I knew was it was the weekend that particular crime happened, and the carjacking of Ripkin’s mom almost exactly a decade later pretty much drowns out this incident. Everyone, of course, assumed I was referring to his mother’s kidnapping the year before. If I were Cal Ripkin, I’d consider living another state.